State Rep. Ryan Kerby violated state law and state ethics rules when he submitted inaccurate teacher evaluation data as superintendent of the New Plymouth School District, according to a review panel convened by a state agency. As a result, the Professional Standards Commission’s review panel ordered that a written reprimand be placed in Kerby’s educator certification file. The panel said Kerby “willfully or deliberately” reported to the state that all 59 of New Plymouth’s teachers were equally proficient, but failed to factor student growth into his teacher evaluations, as Idaho law requires. State law allows for Kerby to seek judicial review of the panel’s order. Kerby did not say definitively on Wednesday if he would seek judicial review. “I’ll tell you right now, if I had the whole thing to do over, I wouldn’t do anything different,” Kerby said. The process played out over the past four months, and become heated at times, according to almost 100 pages of documents obtained by Idaho Education News through a public records request. (All documents are displayed at the bottom of this article). Kerby denied wrongdoing. He fought back with a complaint of his own, accusing state officials of engaging in a politically motivated witch hunt to punish him for exercising his First Amendment rights. He also blames his retired information technology director for the inaccurate upload of teacher evaluation data. Kerby retired as New Plymouth’s superintendent following the 2014-15 school year. Kerby, a Republican, was elected to the Legislature in 2014. He sits on the House Education Committee, which plays a huge role in shaping K-12 policy. His current term ends in 2018. The controversy began in June 2015, when Idaho Education News reported Kerby deliberately awarded identical overall scores on 2014-15 teacher evaluations. Kerby opposed tying teacher pay to evaluations. On July 6, 2017, Idaho’s chief certification officer Lisa Colon Durham worked through the Professional Standards Commission to file a complaint against Kerby. She cited Idaho Education News’ report as a basis for the complaint. The PSC is a public state agency that regulates teacher and administrator certification, and serves as an advisory board of the Idaho State Board of Education. The PSC took on the role of prosecutor in the case against Kerby. After Colon Durham filed the complaint, the PSC investigated and convened a three-person review panel to rule on the case and its appeals. On July 11, Kerby wrote to Superintendent of Public Instruction Sherri Ybarra asking her to block Colon Durham from appointing the review panel. Kerby accused Colon Durham of being biased against him. “Since she is already sheriff, prosecuting attorney and judge, allowing her to hand-select the jury would make it even more biased than it already is at the present time,” Kerby wrote in his letter to Ybarra. State records show Ybarra responded to inform Kerby she forwarded his letter on to Colon Durham, the PSC and two state deputy attorneys general. Throughout the process, Kerby denied he violated any laws or the code of ethics and worked with an attorney to attempt to file a counterclaim against the state. “(Kerby) is in danger of not being allowed to return to his chosen occupation as an educator and school administrator,” his attorney Dan Blocksom wrote in his counterclaim. But Kerby told Idaho EdNews this week that his career as a school administrator is over. Kerby said former Superintendent of Public Instruction Tom Luna had told educators and administrators that nobody from the SDE would look at teacher evaluation data. Kerby said Luna made that comment in 2014, his last year in office. Kerby blamed the PSC and the state for not providing him with the proper training and guidance for conducting evaluations and filing the data uploads. Kerby also blamed Idaho Education News, saying one of its reporters misunderstood or deliberately misrepresented his comments. Kerby also said his district turned in incomplete teacher evaluation data because he heard a rumor that the state would withhold New Plymouth’s payments if evaluations were not submitted by the end of May. The PSC panel chided Kerby, saying he was fully capable of calling the State Department of Education to ascertain the facts. “We cannot excuse failure to properly comply with reporting requirements on the false sense of urgency created by a rumor that was never checked out,” the panel wrote in its Oct. 11 order. Ultimately, the review panel denied Kerby’s appeals, and in a Nov. 8 ruling reaffirmed its order to reprimand him. In his counterclaim, Kerby accused the state of libel, of having “unclean hands” and of failing to provide him any training, guidance or warnings about his conduct on evaluations. Kerby also pointed out that he refused to help an unnamed state agency that was seeking assistance on a bill during the 2016 legislative session because of “several concerns” he had. Finally, Kerby also accused Colon Durham, by name, of having “cooked up” the complaint against him for political reasons. Teacher evaluations are increasingly important in Idaho because the 2015 Legislature voted to tie a teacher’s ability to earn a raise to performance on annual evaluations. Kerby twice voted in favor of the five-year, $250 million career ladder salary law, which tied evaluations to raises. Under state law, school administrators are required to annually complete evaluations for every teacher, factor student achievement into that evaluation and submit the data to the state. For three years, Idaho Education News has scrutinized teacher evaluations and documented potential red flags, including numerous districts submitting that every single teacher scored a “proficient” rating. The PSC’s order to reprimand Kerby appears to be one of the first instances of the state holding an Idaho superintendent accountable for bogus teacher evaluations. At the same time she initiated a complaint against Kerby, Colon Durham filed a complaint against Sugar-Salem Superintendent Alan Dunn. That complaint was also based on Idaho EdNews’ reporting. Colon Durham was out of the office this week and efforts to reach her for comment were unsuccessful. 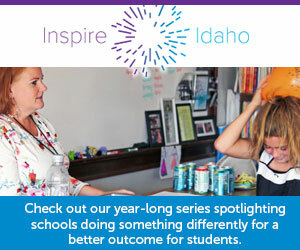 In 2016, after Idaho EdNews published its first investigations into inaccurate teacher evaluation data, the State Board of Education called for the PSC to issue fines of $10,000 to $50,000 against an administrator who intentionally submits false evaluation data. However, the Legislature never acted on the State Board of Education’s recommendation. In April, the creator of the teacher evaluation tool used by the state and the vast majority of its districts told Idaho EdNews that she has concerns with tying evaluations to raises if teacher evaluation data is invalid. “People are justified in being skeptical of how accurate evaluations are because in most states 98 percent of teachers are given the top two ratings, or some unlikely percentage — nobody really believes that’s the case,” said Charlotte Danielson, creator of The Framework for Teaching. Idaho’s evaluation scale includes four ratings. In 2016-17, 97 percent of Idaho’s 17,635 teachers received one of the top two ratings. Although Kerby has retired from New Plymouth, his education certifications remain valid through 2021. Under state law, Kerby has 28 days from the review panel’s Nov. 8 order to file a petition for a judicial appeal. Unless the order is overturned, Kerby’s reprimand would be permanently attached to his certification and personnel file, and will follow him if he applies to work in education again.